Dr. Yousef Al-Abed received his bachelor’s degree from College of Science and Technology in Jerusalem, Israel, and his master‘s from the University of Jordan. He later received his doctorate in organic chemistry from the University of Tubingen in Germany. His thesis focused on developing novel methodologies for the utilization of carbohydrate scaffolds in the syntheses of complex molecules. In 1994, Dr. Al-Abed was recruited as a postdoctoral fellow by Dr. Anthony Cerami to work at the Picower Institute in Manhasset, NY. He became an assistant professor in 1997, and in 2002 he accepted a position as an associate investigator and director of Drug Discovery Programs at The Feinstein Institutes for Medical Research. In 2009, he became a professor of molecular medicine at the Zucker School of Medicine. 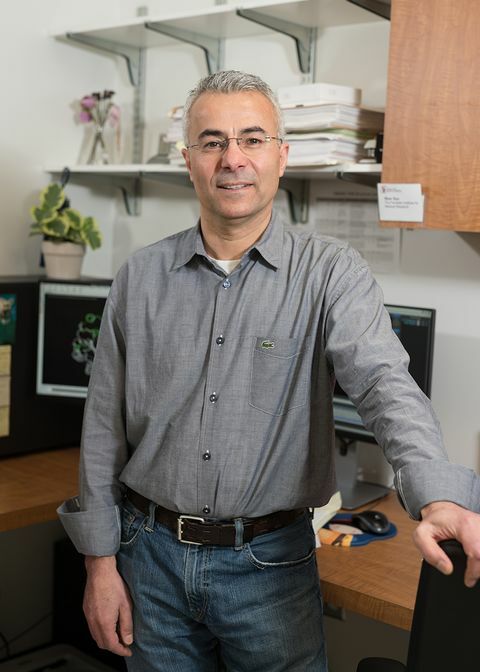 Recently, Dr. Al-Abed was named the head of Feinstein’s newly established Center of Molecular Innovation. This Center leads the discovery and development of novel therapeutics for human diseases including lupus, arthritis, diabetes, Alzheimer’s disease and sepsis. It is an essential component of The Feinstein Institutes that integrates target discovery with medicinal chemistry approaches to generate molecular probes (small organic compounds) and potential drugs. So far, the Center has successfully identified several drug candidates and has repurposed existing drugs to target critical proteins involved in neurodegenerative and autoimmune diseases. Autoimmune diseases affect an estimated 22 million Americans, and their incidence is rapidly growing. These disorders are conditions in which immunological tolerance is defective and normal tissues are targeted for destruction. Although the precise cause of these diseases remains unclear, both genetic and environmental factors confer disease susceptibility. Therapeutic and preventative strategies for autoimmune diseases have been largely disappointing. Anti-cytokine therapies (particularly anti-TNF therapeutics in rheumatoid arthritis) are the newest and most exciting form of therapy, but their high cost of production precludes their widespread use. Moreover, in the case of anti-TNF therapy, 40% of patients receiving therapy do not respond to treatment for unknown reasons. Thus, autoimmune diseases remain a largely unmet medical need. Macrophage migration inhibitory factor (MIF) is a potent pro-inflammatory cytokine implicated in the pathogenesis of numerous autoimmune and inflammatory diseases (e.g. sepsis, asthma, arthritis, cancer, multiple sclerosis and diabetes). X-ray crystallographic studies have shown that MIF is homotrimeric with a catalytic pocket formed between each adjacent subunit. Dr. Al-Abed’s team therefore reasoned that compounds targeting this site could be useful to inhibit MIF activity. The team developed ISO-1, one of the first MIF inhibitors to bind the enzymatically active hydrophobic pocket of MIF. This inhibitor and others have shown efficacy in various models of inflammatory disease where enhanced MIF levels have been reported. Administration of ISO-1 improved survival during sepsis and ameliorated diabetes, and it reduced the size of tumors in animal models (for review see (Al-Abed, 2011, Future Medicinal Chemistry). The success of these studies has led to the continued development and screening of small molecules that can block MIF pro-inflammatory activities by targeting the unique enzymatically active hydrophobic pocket. Recently, the team uncovered thyroxine (T4) as a potential endogenous inhibitor of MIF activity (Al-Abed, PNAS, 2011). These results may have implications for Euthyroid Sick Syndrome (ESS), a condition resulting in low thyroid hormone levels (T3, T4) and high pro-inflammatory cytokine levels, which can result from sepsis, starvation, surgery, trauma, chronic degenerative disease, myocardial infarction, bone marrow transplantation or other severe systemic illness. Dr. Al-Abed’s team found that both L (biologically active) and D isoforms of T4 could inhibit the enzymatic (tautomerase) (in-vitro) and biologic (in-vivo) activities of MIF. Current studies focus on developing and testing thyroxine analogues that inhibit MIF activity and could potentially be used for the treatment of sepsis and other inflammatory diseases, autoimmune disease and cancer. Lupus is characterized by the production of autoantibodies, many of which have specificity for nuclear antigens and contribute to irreversible damage in multiple target organs. Despite the improved prognosis for lupus patients, it is clear that a more specific therapeutic approach is needed – one that eliminates autoreactivity without resulting in generalized immunosuppression. Studies of the teams collaborator, Dr. Betty Diamond and her laboratory, have shown that autoantibodies present in serum of a high percentage of lupus patients with nephritis and in cerebrospinal fluid (CSF) and brain tissue of patients with CNS manifestations of neuropsychiatric lupus (NPSLE) cross-react with a peptide of the sequence D/E W D/EY S/G. The team recently teamed up with Dr. Diamond’s lab and capitalized on this peptide sequence. They used the structural features of the DWEYS peptide and successfully designed a novel, selective and potent small molecule peptidomimetic, FISLE-412, which neutralizes anti-dsDNA/NMDAR lupus autoantibodies and prevents their pathogenic interaction with tissue antigens. Recently, they were awarded an STTR to optimize FISLE-412 and generate several drug candidates around FISLE-412. Both can affect disease progression. Semapimod (formally known as CNI-1493) has undergone phase II clinical trials in Crohn’s disease, and although it lacked statistically meaningful efficacy in these trials, it was demonstrated to be a well-tolerated drug (non-toxic) with largely minimal, self-limiting side effects. The team recently identified CNI-1493 as a potential drug candidate for the treatment of neurodegenerative diseases. Currently, they are focusing their attention to bring this drug to clinical trials in Alzheimer’s and Parkinson’s diseases. Al-Abed, Y., Metz, C., Cheng, K., Al-Jabari, B., VanPatten, S., Blau, S., Lee, H., Ochani, M., Pavlov, V., Coleman, T., Meurice, N., Tracey, K., Miller, E. 2011. “Thyroxine is a potential endogenous antagonist of MIF activity.” Proceedings of the National Academy of Sciences of the United States of America 108(20):8224-7. Bloom, O., K.F. Cheng, M. He, A. Papatheodorou, B.T. Volpe, B. Diamond, and Y. Al-Abed. “Generation of a unique small molecule peptidomimetic that neutralizes lupus autoantibody activity.” Proceedings of the National Academy of Sciences of the United States of America 108:10255-10259. Bacher, M., O. Deuster, B. Aljabari, R. Egensperger, F. Neff, F. Jessen, J. Popp, C. Noelker, J.P. Reese, Y. Al-Abed, and R. Dodel. 2010. “The role of macrophage migration inhibitory factor in Alzheimer’s disease.” Molecular Medicine (Cambridge, Mass 16:116-121. Pavlov, V.A., W.R. Parrish, M. Rosas-Ballina, M. Ochani, M. Puerta, K. Ochani, S. Chavan, Y. Al-Abed, and K.J. Tracey. 2009. “Brain acetylcholinesterase activity controls systemic cytokine levels through the cholinergic anti-inflammatory pathway.” Brain, behavior, and immunity 23:41-45. Saeed, R.W., S. Varma, T. Peng-Nemeroff, B. Sherry, D. Balakhaneh, J. Huston, K.J. Tracey, Y. Al-Abed, and C.N. Metz. 2005. “Cholinergic stimulation blocks endothelial cell activation and leukocyte recruitment during inflammation.” J Exp Med 201:1113-1123. Pavlov, V.A., M. Ochani, M. Gallowitsch-Puerta, K. Ochani, J.M. Huston, C.J. Czura, Y. Al-Abed, and K.J. Tracey. 2006. “Central muscarinic cholinergic regulation of the systemic inflammatory response during endotoxemia.” Proc Natl Acad Sci U S A 103:5219-5223.